This is a copy of the Nov. 18, 1990 edition of the Daily Racing Form. 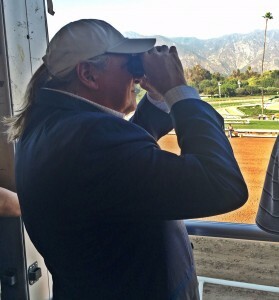 As you may know by now, if you have been reading my columns and posts on “The Pressbox,” I am a collector of all things related to sports, and, in particular, the Thoroughbred industry. I have not purchased any of these items, though. I have saved them. From days (which have turned into years) gone by. I have some of my old press passes from the Kentucky Derby – including the ones when Swale won the Derby in 1984 and when Genuine Risk captured the Run for the Roses in 1980. Have a picture of me interviewing Diana Firestone after that history-making event. I have “The Sporting News,” from 1972 when Riva Ridge captured the Derby for Meadow Hill Farm. I have Derby glasses; Derby programs; Derby Day Daily Racing Forms – all of which I have owned since I purchased those very days. I have winner’s circle pictures from every horse I have either owned outright, or a piece of, framed and mounted. I have a placard signed by the famed trainer Woody Stephens, who won five straight Belmont Stakes in addition to two Kentucky Derbies. I have autographs from Penny Chenery, Lucien Laurin, Ron Turcotte, and a host of other Hall of Famers. I have a concrete jockey statute that stands prominently in my office. On the top of his white hat is the signature of Gary Stevens – my all time favorite rider. I have a signed copy of Bill Shoemaker’s autobiography. I have a copy of Matt Winn’s book about Churchill Downs – signed by the present President of Churchill Downs, Kevin Flanery. I have the official program from the night Seth Hancock was honored by the Thoroughbred Club of America. Seth, a friend of mine from many years ago, was gracious enough to sign it. And, I have a copy of the book “The Hill,” about Santa Anita’s peculiar and unique 6 1/2-furlong turf course that travels down a hill into the home stretch. Stevens – one of the best riders to ever negotiate that course – signed that, as well. I have a halter from Purim’s Dancer – who won the Wishing Well Stakes at Santa Anita – and later ran a game second to two-time Breeders’ Cup Turf Sprint Champion Mizdirection in another stakes to earn Graded-Stakes Placed status. Purim’s Dancer – who I owned with good friends Corey Johnsen and Lenny Kohn – was about half the size of Mizdirection, in flesh and hoof. But Purim’s Dancer had the heart of a champion and as big as California, itself. My version of Northern Dancer. When I came home the other night, my wife had laid on my office desk a deck of six Derby Day pins. Various years. Each from a memorial Derby experience. I looked up and she smiled. “Happy Web Launch,” she said. I cleared off a spot and my wooden shelves and displayed them with pride. And, I gave her a hug about as big as the Pletcher and Johnny V. embrace last Saturday. But as we turn the pages of our Racing Forms and the memories of the past week, and we flip forward to the 142nd Preakness Stakes, I went hunting through my boxes and bins holding my memories and pages of the past. “Northern Dancer, the world’s leading stallion was humanely destroyed here Friday at 5 a.m. following an attack of colic Saturday (wrong day) night at Northview Stallion Station. He was 29. “Northern Dancer had spent Thursday in the paddock, as usual, from 6 a.m. to 1 p.m.; and first showed signs of distress about 10 o’clock. He was attended by veterinarian Dr. Alan McCarthy. “A private burial is planned at his birthplace, Windfields Farm in Osbawa, Ont., according to Winfields President Charles Taylor, the stallion’s syndicate manager. What a week that was. Two of the greatest racehorses and greater influences on the history of the breed itself passed away and left mammoth holes that were to be filled by both of their sons and daughters. But as the world of Thoroughbred racing – and the breeding industry in tow – turns to the second crown jewel of The Triple Crown and the Preakness Stakes to be held on May 20 at Pimlico Racecourse, it seemed fitting to pay tribute to one of Maryland’s leading sons and most famous residents – Northern Dancer. And, watch with interest, a horse deeply rooted in Maryland’s great sire – Always Dreaming. As you read above, Northern Dancer wasn’t born in Maryland. That distinction belongs to Canada. And, after winning both the Kentucky Derby and the Preakness Stakes in 1964, Northern Dancer was retired to stud back in his native Canada. Still today, Northern Dancer is still considered a monument not only in Thoroughbred circles, but in sports history up there – being inducted into the Canadian Sports Hall of Fame. He was later named to both the Racing Hall of Fame in Canada and in the United States. So, one must acknowledge that Northern Dancer still, to this day, probably has a maple leaf somewhere in his casket and in his heart. But after first being retired to stud in 1965 at Winfields Farm in Canada, the “little man” started on a career that no other stallion had ever accomplished before, and none, probably, will ever match in the years to come. Despite the fact that he was so small that Winfields had to build him a ramp so that he could “service” most of his mare suitors and the fact that his initial stud fee was a modest $10,000, Northern Dancer didn’t have any problem stepping up to the task at hand, or the plate in future stallion annals. In his first crop, of 1966, Northern Dancer sired 21 foals. Of that crop, 18 became runners. Those 18 combined to win 16 races – with 10 stakes victories. The total earnings for that crop? How about $1,467,644. In 1968? What would that account for today? Yet, it was only the beginning. In his second crop, Northern Dancer sired the great (not good; GREAT), English Triple Crown winner Nijinsky II. It was he that put Northern Dancer on the international stage. And, it is what soon put Northern Dancer on the move. In 1969 – Taylor, the stallion syndicate that owned Northern Dancer and Winfields Farm – decided to move the world-popular sire to the Maryland division of Winfileds. It was there – closer to the great broodmares of Kentucky and other locations in the United States – that Northern Dancer furthered his name, his reputation and made Maryland a regular stop on any racing fan’s destination plans. You just had to go see this guy. And, why not. In addition to Viceregal and Nijinsky II, Northern Dancer went on to sire major stakes winners Fanfreluche, Lyphard, The Minstrel, Nureyev, Shareef Dancer, El Gran Senor, and Sadler’s Wells. But he was much more than just a stallion residing in Maryland. He was the name that stamped the industry there – including racing. Despite his strong pedigree, Northern Dancer – by the great sire Nearctic and out of the fantastic mare Natalma — did not have a single would-be buyer to reach his $25,000 reserve price at the yearling sales. So, he stayed at home and joined Winfields racing stable. And, although he was listed at 15.2 hands tall, it was commonly known that he was more like just a hair above 15 hands. But it didn’t stop his race career. In didn’t stop his stallion career . And, it didn’t come close to stopping his legacy or his imprint on the history of the game and sport. In fact, it only elevated Northern Dancer’s image and legend even more. On Aug. 2, 1963, as a 2-Year-Old, Northern Dancer started his racing career at little known Fort Erie Race Track. It was a 51/2 furlong maiden race for Canadian-foaled horses only. The legendary jockey Ron Turcotte was an apprentice at the time (more on him later). After a tap of the whip at the 1/16th pole Northern Dancer romped to an impressive victory for a purse of $2,100. Anything. Any where. Any time. And, it showed. In 1964, after trainer Horatio Luro got spun by Hall of Fame rider Bill Shoemaker for the Blue Grass Stakes, Northern Dancer got the services of rider Bill Hartack. In their first marriage together, the duo of Northern Dancer and Hartack got a win by a half-length. For the rest of his racing career, Northern Dancer did not have another rider. And, it was one hell of a ride. On May 2, Northern Dancer drew the 7-hole out of 12 horses. Despite his size, despite his “short” comings, Northern Dancer prevailed over Hill Rise in a track record time that stood to 1973 – only to be broken by the great Secretariat. Then, two weeks later, came the Preakness Stakes – the biggest race in the history of Maryland racing. On May 16, Northern Dancer went off as the second betting choice in the field of six – which was populated by the first five finishers of the Derby. Hill Rise – who Northern Dancer defeated in the Derby – was made the fan’s betting choice. In what may be the best race in Maryland history, Northern Dancer won the 1964 Preakness by a commanding 21/2 lengths over The Scoundrel and Hill Rise. In about a week, another 3-year-old colt, who won the Florida Derby and the Kentucky Derby – just like the great Northern Dancer – will try his feet on the same ground, at the same location, in the same state of Maryland. Always Dreaming will try to add the second leg of the Triple Crown. And, like so many great horses, Always Dreaming has a great dose of Northern Dancer in his blood, as well as in his connection’s dreams. Bodemeister, the sire of Always Dreaming, was bred to a mare named Untouched Talent. Her sire (father) was the great Storm Cat. Storm Cat’s sire was the legendary Storm Bird. And, Storm Bird’s dad was none other than Northern Dancer. Nice touch. But not done yet. Above Perfection, the dam of Always Dreaming, is out of the mare Something Perfect. Her father was Somethingfabulous. He was a son of, you got it, Northern Dancer. Throw in a dose of El Gran Senor – another son of Northern Dancer – into Bodemeister, and you begin to get the picture. Northern Dancer on the sire side. Northern Dancer on the dam side. Nothern Dancer throughout the line. In 1964, just before the Preakness Stakes, Northern Dancer’s trainer – Luro – did something that a lot of skeptics took notice of and some criticized. In the two weeks between the Derby and the upcoming Preakness, Luro sent Northern Dancer through a series of 2 and 3 miles gallops. The idea was to add stamina to his horse. But on Friday morning, just 24 hours before the big race, Luro put Northern Dancer to task. He had him blow out 3 furlongs in a spiffy :353/5 seconds. Bam. There it was – the speed everybody was waiting for and wanted to see. The week before this year’s Derby, trainer Todd Pletcher pulled a little bit of a Luro-like move. Concerned that Always Dreaming was pulling too hard every morning and exasperating himself prior to his first race at 11/4 miles, Pletcher did something he very rarely, if ever does. He switched exercise riders, putting a stonger rider, Nick Bush, in the morning saddle. And, he added draw reins. Bam. There it was – the conservation of speed that everybody was waiting for and wanting to see. This week, Pletcher moved Always Dreaming to Pimlico. It was 52 years ago that Northern Dancer made Maryland history. Now, 52 years later, Always Dreaming – full of Northern Dancer blood and history – wants to do the same. If it happens, it will truly be a Maryland thing. From 1964 to today.